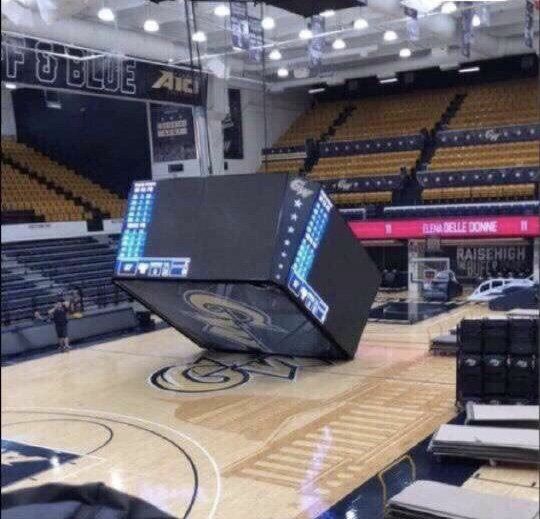 The Jumbotron at George Washington University's main sports arena dropped from its moorings Tuesday and landed on the basketball court. Nobody was injured and the scoreboard was in a lowered position when it fell. WASHINGTON — The Jumbotron at George Washington University’s main sports arena dropped from its moorings Tuesday and landed on the basketball court. The scoreboard at the Charles E. Smith Center was undergoing maintenance Tuesday and was in a lowered position when it dropped unexpectedly, the university said in a tweet. Nobody was injured in the incident and “the scene is being assessed for any damage,” the tweet stated. GWU’s student-run television station tweeted photos of the collapsed Jumbotron.